Even the best-in-class Bluetooth beacons operate with batteries that eventually run out, requiring effort to replace them. 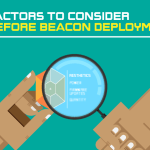 In some cases, these beacons could be spread out over an entire nation, and the physical distances involved can be prohibitive. And that could be a deal killer for the entire proximity marketing project. We hope you come up with even more exciting use-cases with USB beacon 🙂 Check out the newly launched USB beacon and get a cost-effective end-to-end solution to execute your powerful marketing strategies today. Start your journey with Beaconstac.